California has always been a state of both Latino and Anglo cultures. 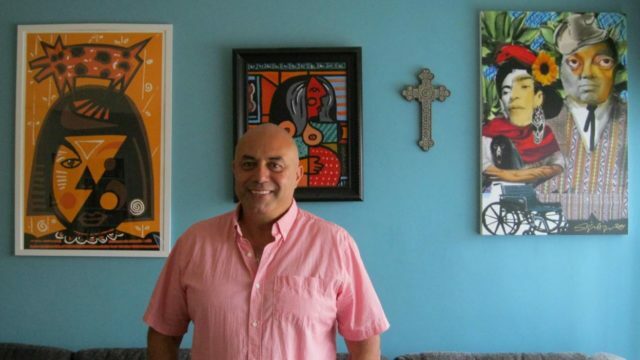 Herbert Siguenza, the Playwright in Residence at the San Diego Repertory Theater, has the gift of melding both cultures together and reaching a diverse audience as seen in the plays, A Weekend with Pablo Picasso, El Henry, Manifest Destinitis, and Steal Heaven. He is a performer who creates his art through writing, acting, and even painting. Siguenza didn’t plan to be a performer when he was a young man. A first generation Salvadoran, he received his BFA from the California College of Arts in Oakland in the 1970’s. He lived in the Mission District in San Francisco and worked as a community visual artist. In those days, that area was the hub of social and artistic non-profits. It was here that he first discovered his voice as a writer and performer. After seeing Luis Valdez’s Zoot Suit in 1978, he became inspired to do Chicano theater which eventually led him to Richard Montoya [son of legendary Chicano poet, Jose Montoya] and fellow Salvadoran, Ric Salinas. Together, they formed Culture Clash in 1984. Culture Clash was a groundbreaking comedic troupe whose biting social satire and commentary skewered everyone. They were irreverent and honest in presenting their view on society, be it Latino or Anglo, starting with their first play, The Mission. That was a hilarious play about three out of work Latino actors who kidnap Julio Iglesias (Siguenza played Iglesias) and keep him hostage until they get a onetime shot on national TV. In 1989, Salinas was shot at close range, a random act of violence. Their work then took on a deeper tone, and while Salinas was recuperating, they wrote a Bowl of Beings, short acts about life, death, and keeping with their humor, pizza. The play was a huge success and well received. It was filmed for PBS’ Grand Performances and was aired nationally. This spotlight brought more attention and in 1993, they were commissioned to write a play about the city of Miami, and Radio Mambo was conceived. In 1996, they were invited to showcase scenes from Radio Mambo at TGC’s National Theater Conference in Princeton. This showcase brought them to the attention of other Artistic Directors, and Sam Woodhouse, Founder and Artistic Director of the San Diego Repertory Theater asked them to write and perform a similar piece about the San Diego-Tijuana area which became, Bordertown, another success. After more than 20 years of working together, the group worked on their last collective piece, Chavez Ravine, a darker and more sophisticated social satire, commissioned by the Center Theater Group in Los Angeles. Chavez Ravine was the story of how the Brooklyn Dodgers left the East Coast and came to Los Angeles; however, it turned into a more revealing story about public housing, over reaching of the press, political ambition, and immigrant families being displaced, not to mention baseball. It was a huge hit and a top grossing show for CTG. In 2001, Siguenza began to pursue a solo career and wrote a play about the Mexican comic actor, Mario “Cantiflas” Moreno, which he performed from 2001 to 2003. He wanted to do a play about his father’s comedic hero. All of this led to him to approach Sam Woodhouse and Associate Artistic Director, Todd Salovey, about doing a one man show at the REP called, A Weekend with Pablo Picasso. Siguenza had been an admirer of Picasso since he was seven years old. At the age of 50, he felt he was ready to play him. After two years of workshops at the REP, the play was presented at the Alley Theater in Houston, Texas. It was directed by Salovey. The show was met with critical success and played at half a dozen regional theaters. It opened at the SD REP in the spring of 2010 and then again in the fall of 2013. This play had a mass appeal to both Anglo and Latino audiences and what was unique about it was that the multi-talented Siguenza not only played Picasso, he also employed his artistic side, making drawings on the spot during the play. His artistic renderings were displayed on the walls of the Lyceum. His next play with cross cultural appeal was El Henry, Siguenza’s futuristic barrio version of Shakespeare’s Henry IV Part One. This high energy, visually stunning play was performed outside for the La Jolla Playhouse‘s Without Walls Festival in 2014. The play even included low rider classic cars. It won a Craig Noel award for best new play. Siguenza then went on to write and act in Steal Heaven, a play about 1960’s activist, Abbie Hoffman in 2015. In 2016, Siguenza began his three year residency at the REP and opened its 42nd season with Manifest Destinitis. Siguenza turned Moliere’s play, The Imaginary Invalid, into one about old California that at the same time, reflected a collective history and commentary on current times, especially in light of Trump’s campaign and subsequent election. In the 2018 season, his melding of cultures will be represented in Beachtown, an adaption of an audience immersive play, Beertown. Beachtown will reflect a San Diego/Southern California setting and people debating what historic artifacts should go in a time capsule. As Siguenza himself says, “I find this work exciting because there is no “fourth wall”, allowing audience members to participate and lend their voice in the proceedings instead of being passive spectators in the dark”. Finally, acting and writing can also be cathartic. In his latest project, Birthday, Siguenza is working on his most personal and darkest piece which also happens to be a musical. It is about people who come back from the dead for 24 hours on their birthday. Siguenza found out he had a son from a fling he had as a young man. The mother never told him. It wasn’t until the young man committed suicide that he found out. His son left behind two boys who only recently met their paternal grandfather, but now see him on a regular basis. In his own personal life, Siguenza has found happiness with his second wife, Samantha, and their six year old daughter, Belen. Belen will be happy because her father will be voicing two characters in the upcoming Pixar movie about Dia de los Muertos, called COCO. It opens Nov. 22.